In one of his final acts as mayor of Duluth, Gary Doty today announced a small expansion on the city's police department. He's held the job for 12 years. On Monday, Herb Bergson will take the oath of office. Bergson promises a different style. But the city still faces some of the same problems it's been struggling with for years. Duluth, Minn. — Duluth's economy has always jumped and dipped along with the boom and bust of the Iron Range. But 15 years ago, then-mayor John Fedo changed things. He converted Duluth's industrial waterfront into a tourist attraction. Now people flock to Duluth from all over the Midwest, and tourism is a mainstay of the economy. As a politician you probably don't want your legacy to be that I fixed your sewer. But it's something that had to be done ... your infrastructure has to be in place, and it really wasn't. 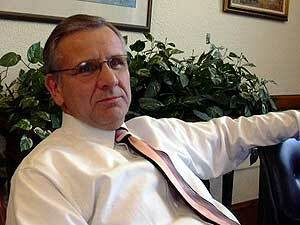 When Gary Doty took over as mayor in 1992, he focused on more mundane issues. He cut city staff to build up a reserve fund in the budget. And he started rebuilding streets and sewers all over the city. "As a politician you probably don't want your legacy to be that I fixed your sewer," Doty says. "But it's something that had to be done ... in order for us to develop as a community. For housing, and for economic development, your infrastructure has to be in place, and it really wasn't." Doty also worked hard to bring jobs to the city. He landed Cirrus Design, an airplane manufacturer, and Uniprise, a company that manages benefits for large businesses. Some of his other ideas were roundly criticized and beaten back by opponents on the city council. An outlet mall he wanted to put on the downtown waterfront, and a golf course for Spirit Mountain, the city ski hill, drew the biggest opposition. Another controversial project was the Technology Village. Doty tore down some old downtown buildings and put up a block-long center for high-tech businesses. As soon as the building was finished, the high-tech bubble burst. But Doty's critics say that wasn't the only reason the city had a problem finding tenants. They say he didn't do enough to make the city attractive to young entrepreneurs. Doty himself might not argue with that. He says he represents a majority of Duluthians, people who see themselves in the middle-of-the-road on most issues. Doty says one of his favorite things about being mayor was representing the city at important events. "You know, saying goodbye to the troops as they're going to Iraq last July, holding a ceremony regarding 9/11. Representing the community at something as meaningful as that is wonderful," says Doty. One event Doty never attended was the Gay Pride Parade. Year after year, he declined to issue a proclamation recognizing the gay community. Doty is a church-going man who's devoted to his family. Critics say he and the city's business leaders are out of touch. They say Duluth is changing, and it needs to change even more, if it wants young people to stay here. During the election last fall, Herb Bergson emphasized that theme. Bergson, a police officer, was mayor of nearby Superior, Wisconsin, for eight years, and recently served on the Duluth city council. He promises to include more ordinary people in city government, especially women and minorities. Bergson says too many of Duluth's young blacks and American Indians feel left out. He says including them in the city's life could even help cut down on crime. "I interviewed a kid once on a homicide, and I asked him, 'Why did you do that? You've got your whole life ahead of you.'" Bergson recalls the young man answered that going to prison wouldn't be much worse than his life as it was. "His life was so hopeless, he didn't care, because prison in some ways was even better than how he lived in his home. And that's sad." Bergson also describes himself as a hands-on politician. "I like to go to the doorstep when somebody has a problem and meet with them face to face," Bergson says. "Have them show me the ditch that doesn't drain correctly, or show me the basement that's leaking because the street isn't fixed right, or show me the pothole in front of their house." Some observers worry that hands-on approach might not work so well in Duluth, a city three times the size of Superior. But the biggest challenge for the new mayor is probably the one that's been plaguing Duluth for years -- keeping people in town. Especially young families. Craig Grau, a political scientist at the University of Minnesota, Duluth, says the public schools are losing students, so they aren't supplying the workforce for the future. "We bring in thousands of people here to go to college, and yet they leave, too," Grau says. "So somebody has to figure out how to renew the city as far as demographics are concerned, in a way that's going to make it prosperous." On Monday, Herb Bergson moves into the mayor's office, the first new occupant in 12 years.